I am rather taken by orbital sanders. As a restorer I didn't buy one, but having been introduced to them last year for the replica bench project, I am keen to have one in my tool kit. The ERO 2412VN from Ryobi is just the job as a starter. It is small, comfortable to hold and easy to operate. The top handle has a grip-zone overmould, speed control and on/off switch. There is also a safety indicator in the form of a "live tool indicator" which glows blue to show that the tool is connected to a live mains supply, ready for use. The pre-punched papers are fitted to the random orbit pad with the now traditional hook-and-loop system, which simplifies changing the sheets. It comes with a dust bag, but could also be connected to an extraction system - definitely a more comfortable way of using the tool. 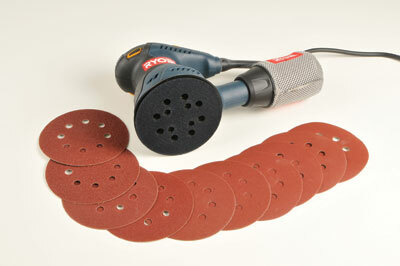 This is a comfortable to use and comfortable on the wallet little sander. 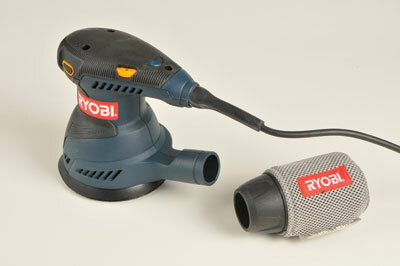 Every tool kit should have a random orbital sander and at this price there is no excuse. It could make the difference between being able to glue-up before locking up, or having to start your next day in the workshop with a glue-up followed by a long pause whilst the adhesive cures! 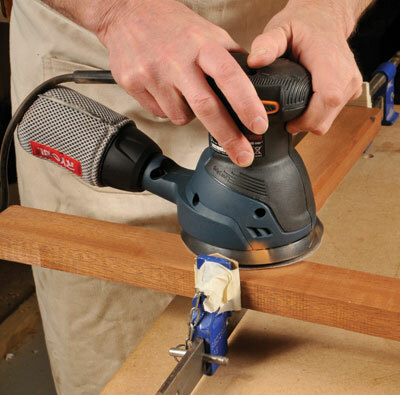 "Every tool kit should have a random orbital sander"